Got up on the wrong side of the bed this morning? This should more than take care of it. We've basically been speechless from a disease caused by the adorable-itis superfluous bacterium since we read this story about the World's Greatest Dad (for real this time), a resident of Germany and generally the nicest guy we've ever heard of. 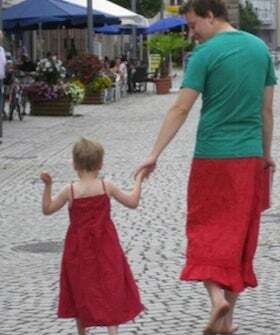 Nils Pickert's young son likes to wears dresses, and instead of freaking out and forcing the poor kid to repress the urge, this guy decided to wear a skirt as a sign of solidarity. It's understandable that even the most progressive of parents would be concerned about young boys cross-dressing (although for some reason the same issues don't seem to apply to female "tomboys"). After all, even if they genuinely don't mind their sons wearing dresses, painting their nails, or playing with dolls, no parent wants to see a child bullied and tormented at school. That certainly occurred to Pickert, but he quickly came around and decided that rather than make his son conform to the rules of their "very traditional" town, he would stand up for his child's rights.